Frank Recruitment Group is currently on the lookout for a Team Leader to join our New York office. We employ over 2,000 people across the globe under our nine unique recruitment brands, and specialize in connecting employers with candidates that are highly skilled in operating niche IT software platforms. Given the technical nature of our focus areas, our consultants spend a lot of time speaking to clients and candidates to find out exactly what they are looking for. This attention to detail is essential to providing a comprehensive recruitment service. Our business operates in over 70 countries worldwide, and we’re looking to recruit Team Leaders in our New York office to satisfy the demand for our services. Experience of at least 3 years in a sales or 360 recruitment environment, preferably in a leadership role. The ability to lead by example, completing a minimum of two individual deals per month, so sales skills are essential. Attendance of networking and industry events to bolster contacts and improve product knowledge. The ability to teach and be taught. Leadership qualities that capture the attention and respect of your team. As a Team Leader you will be engaging with candidates and clients to discuss everything from the latest industry developments to technical candidate requirements. Having a good working knowledge of recruitment is also essential, as you will be entrusted with negotiating terms of business with new clients. Team Leaders at Frank Recruitment Group will set targets for their team and must implement an action plan if individuals fail to meet these targets. 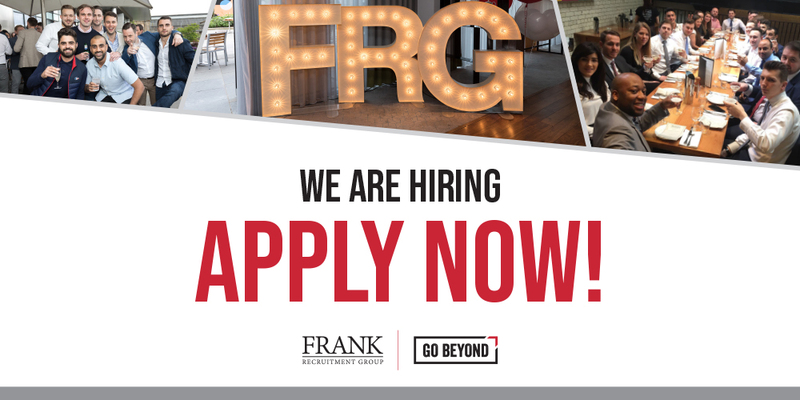 Our company policy is to promote from within, and as a Team Leader you will play a huge part in coaching the next generation of great minds in Frank Recruitment Group.